All Things Tangled: New Stuff! I finally have some new items listed! 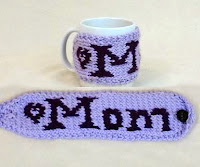 For mother's day, I have two "Mom" coffee cup cozies! One in purple (click here) and one in blue and green (click here). Both I think will be great gifts for that special mother. Moms need coffee, at least I would if I were a mom, and keeping it warm is important. I also listed an American Flag Dog Sweater. This will be great for memorial day or the forth of July. I'll also be listing the pattern for this soon, I just need someone to test out the directions for making the star. Just because I think its clear, doesn't mean other people will. And the coffee cup cozies are a great idea...perfect for Mother's Day!